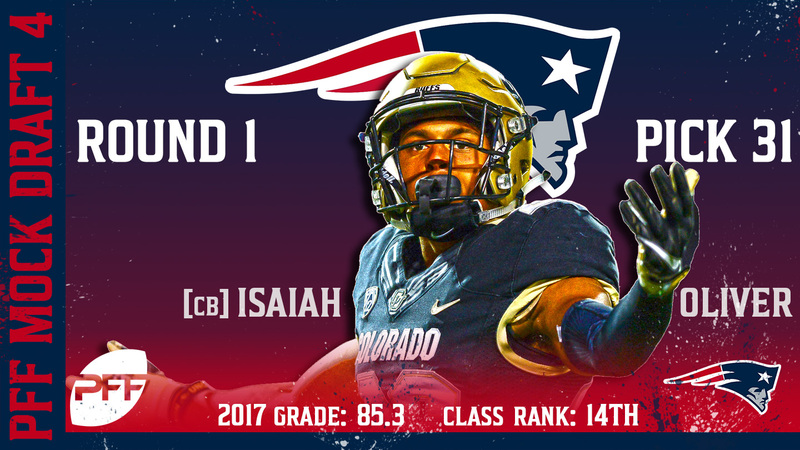 Every year, we break open the mock draft for a 3-round look which is an excellent exercise in evaluating the depth of the draft and a number of potential strategies for various teams. The first thing that stands out about the 2018 draft compared to last year, is how weak it feels compared to the 2017 version. While last season, teams were getting great value in the third and fourth round, this year’s draft is wide open in rounds two through four, as there are players with even bigger question marks than previous draft years. The 2018 NFL Draft Guide is here! 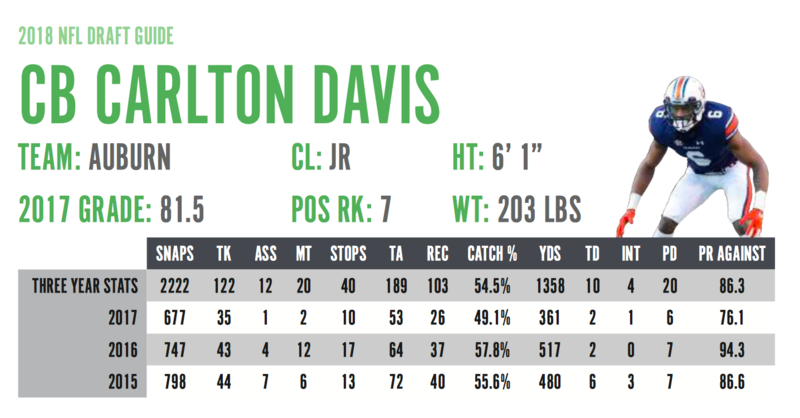 For PFF Edge & Elite subscribers, a comprehensive guide featuring player profiles of signature stats, grades and exclusive PFF content including position by position rankings. Find out more information here and join PFF now! As always, this mock draft is based on what I would do as general manager of each team, and many of the picks have remained and will remain the same throughout the process. The nation’s highest-graded quarterback for two straight years, Mayfield’s production has been at another level than his peers and every way the numbers are sliced, he comes out at or near the top. 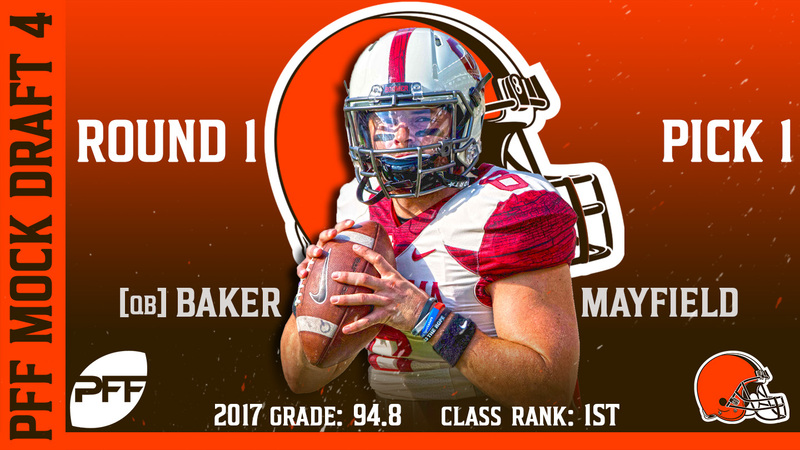 The NFL is more than just college production, but Mayfield has shown well in important areas, including his ability to make “NFL Throws” (as outlined in our QB Annual as part of PFF Edge) as well as his accuracy on tight-window throws, as he had the highest percentage in the class at 52.4 percent. Mayfield’s accuracy and decision-making make him the top signal-caller in the class. Not far behind Mayfield, Darnold has a few questions to answer after a rough stretch in 2017, but it was still a solid sophomore campaign after an exceptional debut as a redshirt freshman in 2016. He has the special throws in his arsenal, from his middle-of-the-field anticipation, to his ability to throw receivers open in tight windows, to his ability to create big plays outside of structure. The question for Darnold is the turnover-worthy plays that were a problem last year, particularly his ball security in the pocket, but Darnold’s shown efficiency in all aspects of the game and there’s a path to him being the top quarterback in the draft if he can clean up just a few parts of his game. 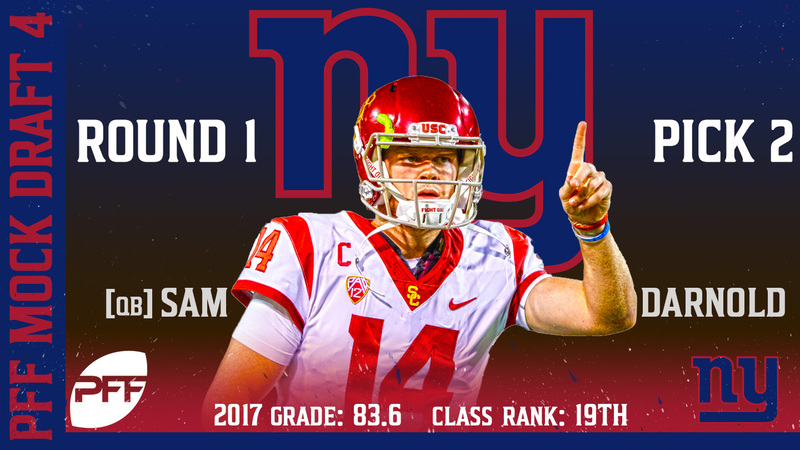 The Giants must take advantage of their positioning at the top of the draft to select their signal-caller of the future. 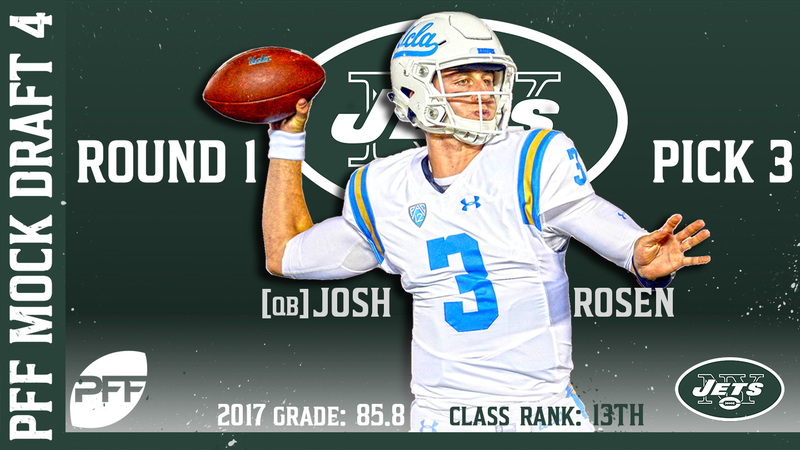 The Jets moved up to get a quarterback and despite having Rosen third on our quarterback board, he’s still worth a look here at No. 3 overall. He never really dominated at UCLA, always grading between 84.0 and 86.0 in the PFF system, but he’s an excellent intermediate level thrower where he can squeeze the ball into tight windows. Rosen must improve his decision-making as he’s always been on the lower end of the turnover-worthy play spectrum, but even as a high-volatile passer, he adds enough to the offense to win games and the Jets need a young quarterback capable of making those big-time throws. After posting the top season we’ve seen from an interior defensive lineman, Hurst should be one of the first defensive players off the board. His excellent first step, pad level and hand usage make him difficult to block both in the run game and as a pass-rusher, all adding up to one of the most disruptive interior defensive linemen to enter the league over the last few years. Add Hurst to the Browns defensive line overhaul and reap the rewards. While the Broncos would love to take a quarterback, they still have the Case Keenum bridge to hold them over. Instead, they go with the best defensive player on the board in James who is a safety in name only. He’s a versatile playmaker capable of covering tight ends, playing the run or rushing the passer. 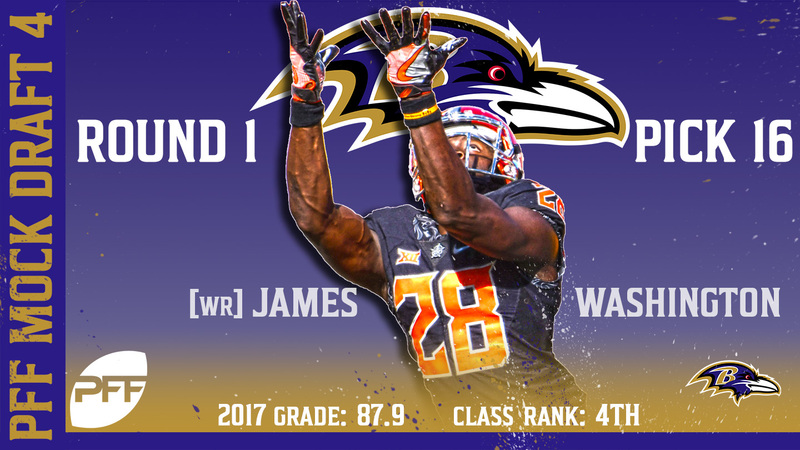 James posted the top safety grade in the nation in both 2015 and 2017, and his all-around game is perfect for the NFL. The Colts need help all over the defense, and they start their franchise-altering draft with one of the best ball hawks in the class. Jackson had a breakout 2017 campaign that saw him lead the nation in both interceptions (eight) and pass breakups (17), all while allowing a passer rating of 31.3, fifth-best in the country. Jackson has the skills to excel in any scheme and he’s the first piece in what could be a defensive overhaul for the Colts. While Barkley is receiving top-3 hype, it’s hard to slot him in over potential franchise quarterbacks and blue-chip defensive players. 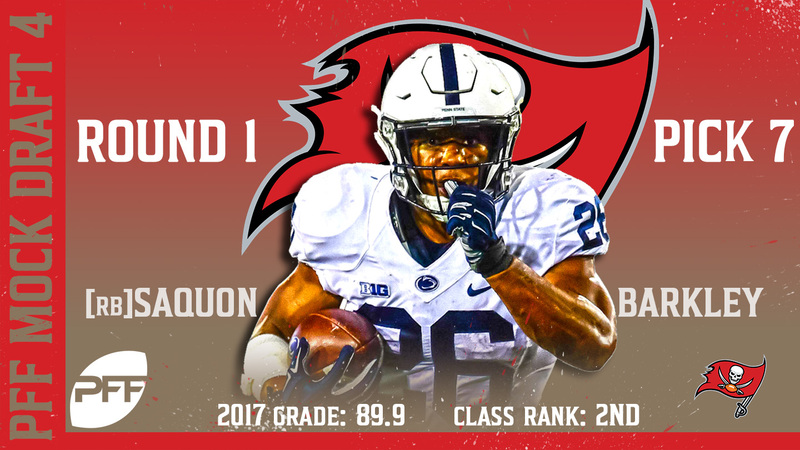 However, he’s a nice fit here to the Bucs who continue to assemble offensive playmakers for quarterback Jameis Winston. Barkley’s receiving ability makes him more valuable than a traditional running back and he led FBS running backs with 632 receiving yards last season. He’s shown the ability to win from multiple alignments and his value will be maximized if used all over the formation and as a check-down option for Winston. Many analysts are calling Nelson the best player in the draft and it’s hard to argue that point, but he drops to eight due to more valuable positions coming off the board first. Nelson is a dominant run-blocker who improved every year in pass protection at Notre Dame, capping his career with only five pressures allowed on his 430 attempts. He’ll step in nicely into the role vacated by former left guard Josh Sitton who was released this offseason. Yes, the 49ers continue to draft defensive linemen in the first round, but Landry brings a body type and skillset not currently on the roster. He has the explosiveness to win on the edge and it showed up in 2016 when he finished with 18 sacks, seven QB hits and 44 hurries on only 322 rushes. 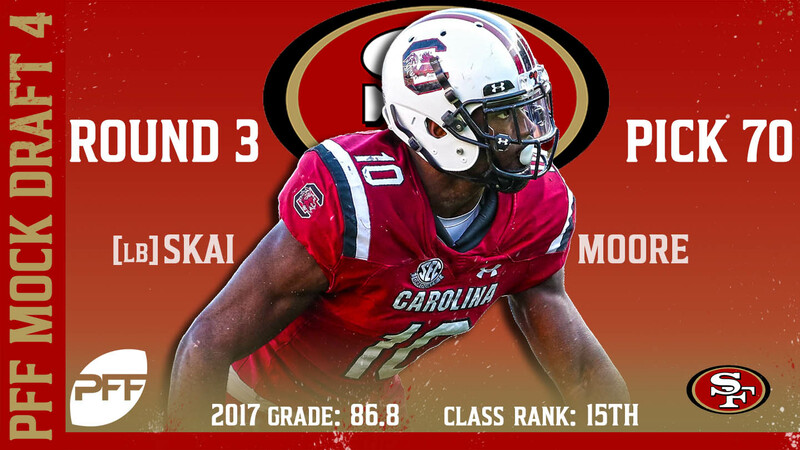 He regressed slightly in 2017 while also battling injury, but at his best, he’s the top pass-rusher in the class while adding solid play against the run, and the 49ers have a chance to add another valuable piece to their defensive front. 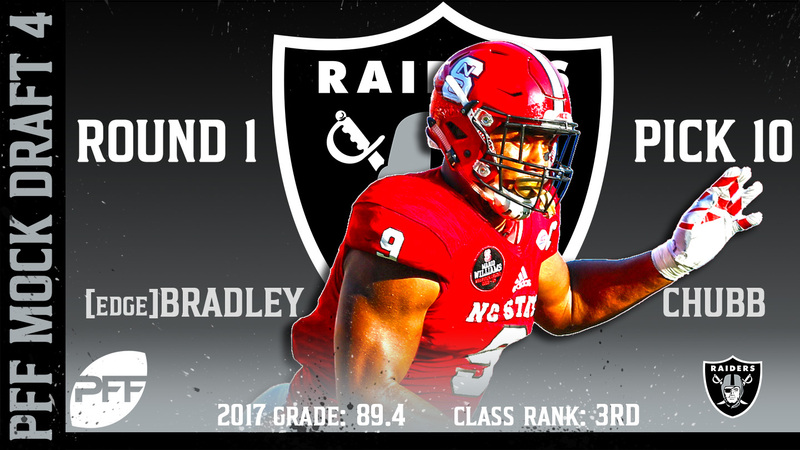 The Raiders are still looking for a viable threat opposite Khalil Mack and Chubb offers a three-down option on the edge. He’s outstanding in the run game where he rarely loses and finished second in the draft class with a run-stop percentage of 11.0. Chubb has continued to improve as a pass-rusher where he has the burst to challenge tackles to go with the power and hand usage to win off the edge. Seemingly always in need of a chase-and-run linebacker, the Dolphins add the draft’s best in Smith who is a three-down playmaker. He has excellent range and closing speed in coverage and he always finds the ball in the run game. Most importantly, Smith finishes the play when he gets there as he missed only 18 tackles on 249 career attempts. The Bills obviously have a major need at quarterback, and they will likely look to move up in the draft in reality, but they’re going to take their chances by grabbing Ward here and banking on one of the next three signal-callers is available at No. 22 overall. Ward has the speed to match up on the outside and the quickness to play in the slot, and he may be the best cornerback in the draft for matching up with good route-running receivers. He allowed a completion percentage of only 35.1 last season. 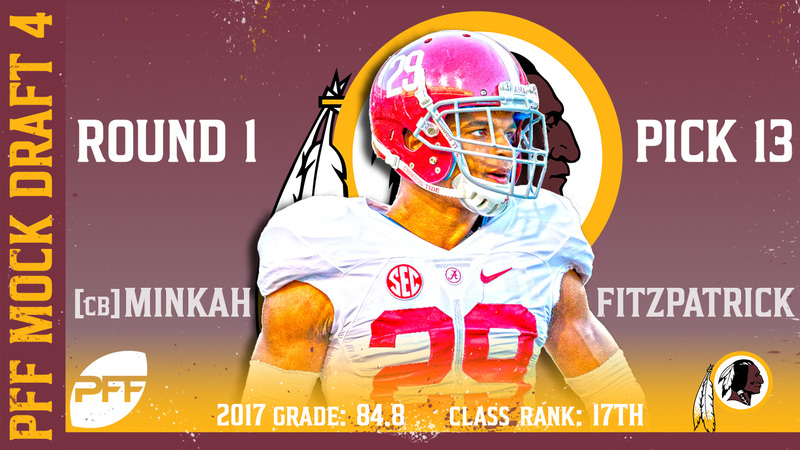 With the Kendall Fuller trade to the Chiefs, the Redskins have holes to shore up in the secondary. At worst, Fitzpatrick looks like a good slot corner or safety, though his size makes him an intriguing option as an outside cornerback despite playing only 13 snaps there last season. However, keeping Fitzpatrick in the slot, may be the most valuable use of his skillset and he has three strong years of grading under his belt on 2,281 career snaps. One of the draft’s biggest QB-needy teams, the Cardinals will turn to Jackson’s big-play ability. He had the nation’s top rushing grade in each of the last two years, and he’s capable of making multiple reads and tight-window throws, though the down-to-down accuracy is lacking for Jackson at this point in his career. Still, there’s an offense to be built around his skillset, and he’s worth a look in the first round. Washington has a second gear downfield and the ability to track the ball in the air, a good combination to try to get QB Joe Flacco’s deep ball back on track. The Ravens have added a few pieces to their receiving corps this offseason, but there is still work to be done and Washington led the nation with 815 yards on deep passes last season. While the Chargers used some draft capital on the offensive line last season, there’s still work to be done, and McGlinchey can start immediately on the right side with an eye toward playing left tackle in the future (though both positions are of equal value and it doesn’t matter which side he plays). McGlinchey is a powerful run-blocker, leading all tackles with a 95.0 run-blocking grade last year while allowing only 16 pressures. It was a disappointing 2017 season for Williams after he struggled early before battling injury, but he was among the best offensive tackles in the nation in 2015 and 2016. He allowed only four pressures in 2016 and his movement skills and power allow him to make any block in the run game. Many evaluators see a future at guard for Williams, but he deserves a shot to stick at tackle, a position where the Seahawks have plenty of room to improve. At 340-plus pounds, Vea is more than just a run-plugger, though he can certainly wreck blocks in the run game. He has the power to push the pocket and his pass-rush productivity of 10.3 ranked eighth in the draft class last season. Vea finished fifth in run-stop percentage at 12.1 while grading at 91.6 against the run, showing that he can disrupt and finish plays. He adds a much-needed big body to the Dallas defensive line rotation. The nation’s top-graded center for two straight years, Ragnow can play any of the interior offensive line positions and the Lions could slot him in at either left guard or center. Ragnow rarely loses blocks in the run game and he only allowed 15 pressures over the last two seasons. With the trade for left tackle Cordy Glenn, the Bengals knocked one thing off the to-do list for the draft. That frees up their options, but they attack the offensive line again with the addition of Wynn who will likely transition from left tackle to guard at the next level. Wynn ranked fifth among draft-class tackles with a pass-blocking efficiency of 98.7 and he plays with natural leverage in the run game that translated to an 88.6 grade last season. 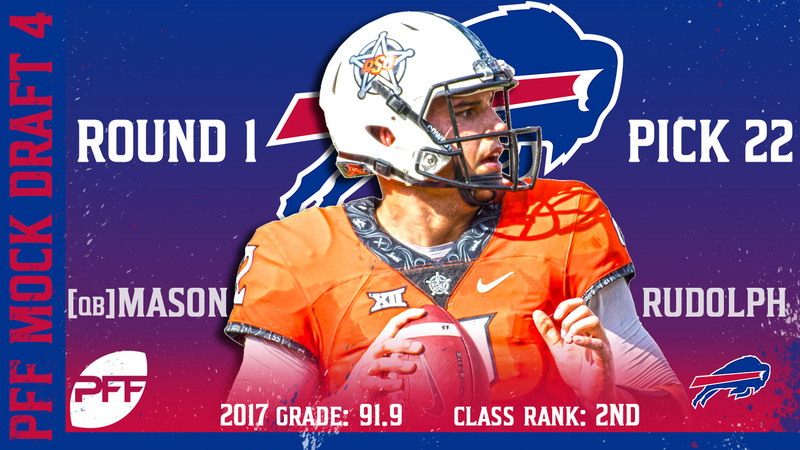 The Bills are happy to take a chance on Rudolph at this point in the first round. He is a solid intermediate and downfield passer, especially the vertical route tree outside the numbers, though he must improve his accuracy in the short game. Rudolph is a difficult evaluation as he was strong in key areas, including posting the top third-down grade in the draft class, but he also ranked 34th in PFF grade in the red zone. New England’s aggressive move allows them to answer a few roster questions and while linebacker or edge defender could be good value, they go with Goedert to add another playmaker to the offense. Even beyond any rumors about TE Rob Gronkowski’s future, New England has been aggressive in finding complementary tight ends for Gronk’s greatness and Goedert has the after-the-catch ability and catch radius to be a proper mismatch weapon all over the field. With guard Andrew Norwell gone, it’s a perfect time for the Panthers to re-load at guard and Hernandez is a great fit for their power-running scheme. He moves people at the point of attack and packs a punch as a puller, all leading to back-to-back elite overall grades in both 2016 (95.2) and 2017 (90.3). Hernandez has surrendered only four pressures over the last two years and he had an excellent week at the Senior Bowl. The Titans need youth on the edge and Davenport is an excellent fit as he may need some transition time in the NFL. He has great size and power, allowing him to set the edge and push the pocket, and he finished fourth in the draft class with a pass-rush productivity of 16.4 last season. He can slot in behind Derrick Morgan and Brian Orakpo before taking over one of the spots on the edge in a year. Gallup projects as an outstanding No. 2 receiver, and that’s exactly the role he’ll fill opposite Julio Jones. Gallup has been one of the nation’s most productive receivers over the last two years, leading the way with a 92.0 overall grade last year and ranking second with 4.34 yards per route in 2016. He can win with his route-running or after the catch, and he adds a perfect complement to Jones as the Falcons reload at wide receiver after the loss Taylor Gabriel this offseason. The defensive overhaul continues in New Orleans as Vander Esch adds an athletic presence to the front-seven. He flies to the ball in the run game and has good range in coverage and he led the nation with 76 total stops a year ago. 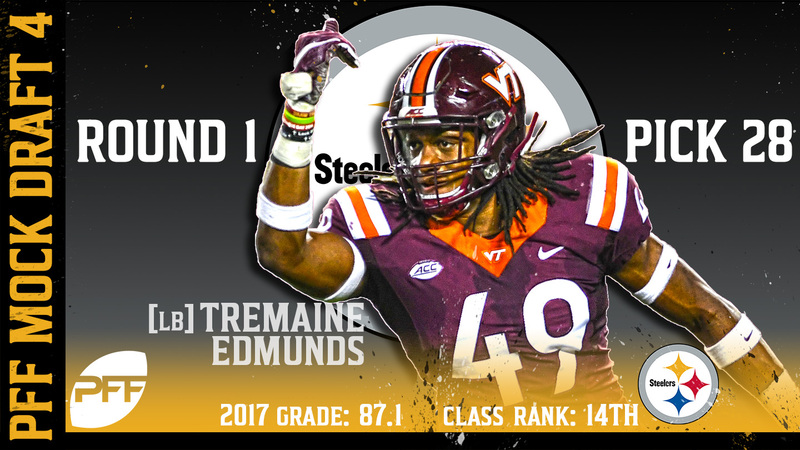 One of the most unique body types in the draft, Edmunds is an oversized linebacker at 6-foot-5, 254 pounds, but he has traditional linebacker skills. He can play all three downs in the middle of the Pittsburgh defense, adding range in coverage and an exceptional lateral movement in the run game. If Edmunds can clean up parts of his game, including a penchant to take on the wrong side of blocks, he could become a steal as an every-down linebacker. With receivers Allen Robinson and Allen Hurns moving on, Sutton is a good fit to step in as a big-bodied receiver capable of winning at all levels of the field. He’s 6-foot-3, but looks extremely nimble on tape, forcing 26 missed tackles on 143 catches the last two years, and that was backed up by a 6.57 3-cone drill at the NFL Combine. Sutton uses his big catch radius well down the field and in the red zone and he’s a good fit for QB Blake Bortles. The Vikings add depth to the defensive backfield with Alexander who is one of the best playmaking corners in the draft. He has the speed and quickness to play on the outside or in the slot, and he’s coming off an outstanding 2016 season (88.3 grade) and a 2017 season that saw him rank second in yards per cover snap (0.26) in an injury-riddled campaign. New England adds a press corner in Oliver who can step in and compete with newly-acquired CB Jason McCourty on the outside opposite CB Stephon Gilmore. He has good size and ball skills as he’s broken up 23 passes on only 146 targets over the last three years. Oliver plays vertical routes well and he’s allowed a completion percentage of only 45.5 percent on passes into his coverage. The run on cornerbacks continues with Jackson, who has elite speed and quickness, making him an excellent fit in the slot. With Patrick Robinson moving on in free agency, Jackson can step into the vital slot cornerback role in the Eagles’ secondary, adding even more depth to a position that has gone from weakness to strength over the last two years. With left tackle Joe Thomas retiring, the Browns match need and value nicely with Jones at the top of the second round. He improved every year at Ohio State, peaking with an 84.9 overall grade last year and a 98.0 pass-blocking efficiency that ranked 14th in the draft class. Penny’s combination of size, speed and quickness led to the No. 2 elusive rating in the class last season at 128.6. He can be a three-down option due to his receiving ability, though he must improve in pass protection where his 88.3 pass-blocking efficiency ranked 73rd in the draft class last season. Moore has playmaking potential both outside and in the slot as he has the speed to make plays down the field and the acceleration to maximize YAC opportunities. He adds a versatile option as the Browns look to revamp their receiving corps. While Key comes with question marks, his high-end play puts him among the best pass-rushers in the draft class. The Colts could hit a home run with this pick if Key gets back to his freshman and sophomore year level of production when he picked up 114 pressures over the two-year period. The Colts attack the defense once again, this time adding an athletic interior presence in Bryan who had a breakout 2017 season. He was disruptive against both the run and as a pass-rusher on his way to an 87.5 overall grade last year. The Bucs add depth to the defensive backfield with Hughes who had an outstanding 2017 season, finishing tied for fifth in the country with an 88.8 overall grade. He allowed a passer rating of only 35.5 into his coverage and while he has room to improve after playing only 1,049 career snaps, his current production and athleticism make him a worthwhile investment. There’s some risk to Nelson’s game, but he was outstanding in 2017, allowing just 37.7 percent of passes to be completed into his coverage. The Bears did well to keep their secondary intact this offseason, but there’s still room for an influx of youth and depth on the back end. 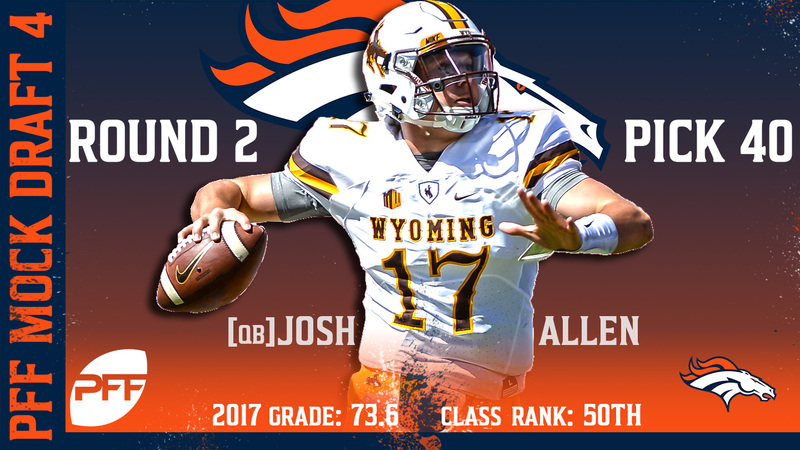 Allen’s boom or bust nature fits better in the second round and the Broncos are happy to take a shot at this point in the draft. He has a cannon for an arm and excellent athleticism, which somewhat makes up for his subpar accuracy, but he must improve his willingness to go through progressions and make plays within the structure of the offense. He finished with disappointing 74.1 overall grade last season after a solid 84.7 mark in 2016. Perhaps the best pure runner in the draft, Jones posted the top rushing grade in the nation at 95.5 last season. His has speed, vision and a willingness to finish runs that will have him stealing carries from the veterans currently residing in the Oakland backfield. Gesicki stole the show at the combine with an incredible workout and his size and athleticism shows up as a mismatch weapon on the field. He’s not much of a blocker, but Gesicki gives QB Ryan Tannehill another big target who can win over the middle of the field or on the outside. Evans has the versatility the Patriots covet as he can play a traditional linebacker role or tap into his early edge-rushing days when he got after the quarterback at a high rate in 2014 and 2015. He’s a good athlete who graded at a strong 83.5 against the run last year, but still has to improve in coverage. After an outstanding start to his career, Chubb battled injury and finally appeared to be back to form last season. He maximizes his offensive line’s blocking as well an any running back in the class and he averaged an impressive 3.7 yards after contact per rush in his four-year career. Green Bay adds another second-round cornerback in Davis who brings length and physicality to their secondary. He’s a solid press man corner and his high end may be even better than what we saw in college after he graded at 81.5 overall last season. Even with TE Tyler Eifert back in the mix, Andrews adds a fine complement as a move tight end and mismatch option in the slot. He was essentially a slot receiver at Oklahoma and he used his quickness and route-running to average 2.63 yards per route, second-best among tight ends in the class. The Cardinals have some rebuilding to do at wide receiver and Wilson has the potential to play both outside or in the slot. He ranked seventh in the draft class with 3.45 yards per route and he finished second with 655 yards on deep passes last season. Harrison projects as a box safety and his strong feel for zone coverage makes him a good fit for the Chargers. He can also slide in at linebacker in dime sets, adding much-needed middle-of-the-field athleticism to the Chargers’ defense. His 85.9 overall grade ranked 11th in the nation last season. The Colts finally pick an offensive player and Guice could step right in as the feature back in Indianapolis. He has good patience, quickness and power, allowing him to grade over 85.0 overall in each of the last two seasons. St. Brown offers a large target at nearly 6-foot-5, but he also has the explosiveness and quickness to create separation down the field. He averaged 16.1 yards per reception while dropping only six passes on 98 catchable targets during his career. The Lions continue their search for an efficient running game by adding Michel who excels as a one-cut, zone runner. He ranked sixth in the draft class with an elusive rating of 95.1 last season. Turay rejuvenated a promising career with a solid 2017 season, giving him an impressive track record rushing the passer with 16 sacks, 24 QB hits and 70 hurries on only 548 rushes in his four years at Rutgers. At the very least, Payne adds a much-needed run-stopping presence to the middle of the Bills defensive line after grading at 85.9 against the run a year ago. Payne has work to do as a pass-rusher, but his 83.9 grade last season was a step in the right direction. The Chiefs’ first pick of the draft addresses a need as they must find more production rushing the passer off the edge. Okoronkwo produced 21 sacks, 21 QB hits and 69 hurries on 641 rushes over the last three years. The Panthers need youth on the edge and Mata’afa has some transitioning to do after playing more on the interior in Washington State’s scheme. He has three strong years of production, grading over 80.0 in every season while topping out at 87.3 last season. Miller can play on the outside or in the slot as he has the speed to stretch the field and the quickness to win as a route runner. His 3.47 yards per route ranked fifth in the draft class last season. The Titans get their linebacker here in the second round as Jewell offers three-down ability after posting three straight years of excellent overall grades. He ranked 10th in the class with a run-stop percentage of 12.4 to go with a solid 83.2 coverage grade. Atlanta adds depth to the secondary with Nickerson who has the speed and downfield playmaking ability to be a difference-maker. He allowed a passer rating of only 41.0 into his coverage last season and only 32.5 in 2016. There’s still a need for playmakers in San Francisco and Ateman brings a big catch radius and red zone target with his 6-foot-4 frame. His 3.50 yards per route ranked fourth in the class last season as did his 134.7 passer rating when targeted. 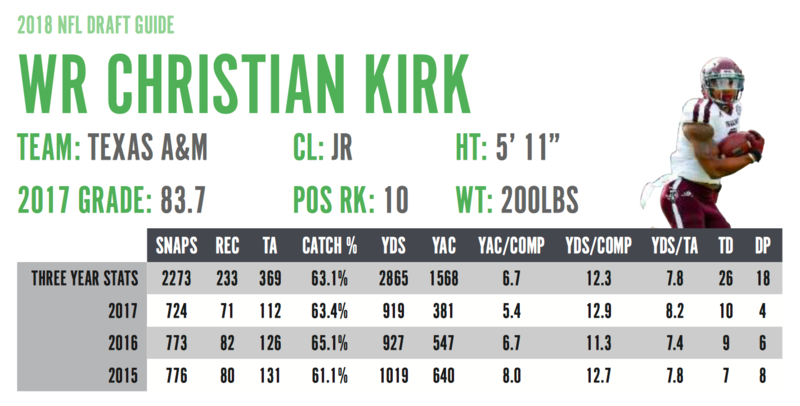 There’s still room for more explosive players on Pittsburgh’s offense and Kirk adds a vertical presence from the slot. His 891 slot yards ranked third in the class last season and his 387 deep yards ranked 14th. Settle has some work to do to improve his technique, but he has the size, strength and get-off to disrupt plays. He posted an impressive 86.0 overall grade last season as a redshirt sophomore. McIntosh’s penetrating style fits well in Minnesota where they need depth at 3-technique (defensive tackle lined up over the guard). McIntosh had a breakout 2017 campaign that saw him grade at 88.0 overall, 13th-best in the nation among interior defensive linemen. It’s a good time in the draft for the Patriots to add a quarterback to the mix and Lauletta is a good fit for the system due to his intermediate level accuracy (highest intermediate grade in the draft class). He has work to do on the deep ball after ranking 34th in the draft class, but Lauletta’s short and intermediate accuracy give him a good foundation on which to build. Freeman had an outstanding career at Oregon, though it peaked in 2015 with one of the better seasons we’ve seen from a running back. He ranked 14th in the draft class with an elusive rating of 76.1 last year. Crosby has two outstanding years of production under his belt sandwiched around an injury-riddled 2016 season. He allowed only seven pressures in all of 2017. Price has four years of starting experience along the interior offensive line and he can slot in either at center or guard for the Giants. His run-block success percentage of 92.0 ranked sixth among draft-class centers in 2017. While Clapp played center at LSU last season, he’s also had success at guard, and that’s where he’ll slot in up front for the Colts. He ranked second among draft-class center with a run block success percentage of 93.4 last season. Despite the poor workout at the NFL Combine, Brown is still worth a look as his massive frame engulfs defenders in the run game. He allowed only 11 pressures on 479 attempts in Oklahoma’s O-line-friendly scheme last year. While he may not replace Jason Pierre-Paul, Ejiofor adds run-stopping size on the edge and he can get after the quarterback after notching 18 sacks, 14 QB hits and 47 hurries on 715 rushes over the last two seasons. One of the best coverage linebackers in the draft, Moore is a key subpackage contributor at worst while providing insurance in the middle for troubled linebacker Reuben Foster. Moore had the nation’s No. 7 coverage grade last season at 88.8. With CB Aqib Talib out, the Broncos are looking for depth in the secondary. Stroman had an excellent college career, allowing only 41.9 percent of passes to be completed into his coverage while picking off nine passes and breaking up 22 more on only 124 targets. After four productive years at left tackle at Nevada, Corbett showed well when transitioning to center at the Senior Bowl. He could play either guard or center at the next level. Hubbard fills a need for youth up front for the Dolphins. He had a productive career at Ohio State, finishing with 21 sacks, 23 QB hits and 66 hurries on 791 career rushes. White played West Virginia’s slot/safety hybrid role and he excels against the run, where he posted the top grade in the nation among cornerbacks last season, and in underneath zones. That makes for a good fit as a strong safety in San Francisco’s defensive scheme. Phillips adds another piece to Oakland’s overhaul in the secondary and he has the ability to cover the slot. He graded at 80.0-plus overall in each of the last three seasons. Griffin’s role at the next level is a question mark as a he’s an outstanding pass-rusher despite weighing less than 230 pounds. He can play traditional linebacker in base while becoming a movable chess piece as a pass-rusher where he picked up 19 sacks, 13 QB hits and 51 hurries on only 476 career rushes. The Bengals add another weapon in the middle of the field as Coutee’s speed and quickness make him a vertical and horizontal threat from the slot. He ranked eighth in the nation with 542 yards on deep passes despite raking only 114th in deep targets with 18 last season. The Chiefs have holes to fill in the secondary and Williams has a chance to fill one of them after coming off one of the most productive years in the nation in 2017. He ranked third in the country with a 90.9 overall grade, while allowing only 36.0 percent of passes to be completed his way. O’Neill is an athletic tackle who has a chance to develop into a starter down the road. He struggled at the Senior Bowl, but allowed only 13 pressures over the last two seasons. 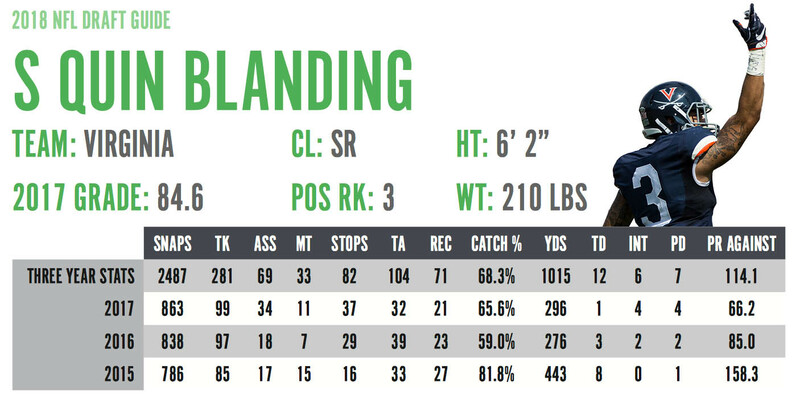 Blanding had an excellent career at Virginia that saw him miss only 43 tackles on 502 tackle attempts. He works well close to the line of scrimmage where he recorded 50 tackles when lined up within eight yards of the line of scrimmage, second-most among safeties last season. Dallas continues to add to its stable of playmakers with Akins who is an athletic receiving weapon. He ranked third among draft-eligible tight ends with 1.93 yards per route last season. A former five-star recruit, Thomas developed late in his career at Miami, where he posted an 83.9 grade last season. He’s a solid run defender with more in the tank as a pass-rusher and the Lions will add him right into the defensive line rotation. One of the nastiest run-blockers in the draft, Teller has an incredible four seasons grading at 80.0-plus overall and he ranked ninth in the draft class with a run-block success percentage of 92.2 in 2017. Nnadi is a nice fit for the Chargers’ defensive front as he’s a stout run-defender, ranking seventh in the nation with an 87.6 grade in that department last season. Johnson adds a fine complementary piece to the Panthers’ backfield as he’s an efficient runner who finished sixth in the nation with an 89.6 overall grade last season. The Chiefs add a potential coverage linebacker to their corps of run-stoppers as O’Daniel is one of the most athletic linebackers in the draft and he graded at 83.8 in coverage and 85.7 against the run last season. The Rams take another stab at solidifying their pass-rush on the edge with Nwosu who broke out to grade at 86.2 overall last season while leading the nation with 10 batted passes to go with 62 total pressures. Smith adds a potential big-play threat to the Carolina offense after catching 70.8 percent of his deep targets (second in the nation), and tying for the national lead with nine touchdowns on deep passes. The Titans are building a versatile group of coverage players on the back end and Moore adds a long, athletic safety capable of matching up with receivers one-on-one. His 87.2 overall grade ranked sixth in the nation last season. Lewis adds depth up front for the Falcons after a solid college career that saw him pick up 27 sacks, 21 QB hits and 83 hurries on 1,142 career rushes. It’s a good spot for the Saints to roll the dice on a potential quarterback of the future. 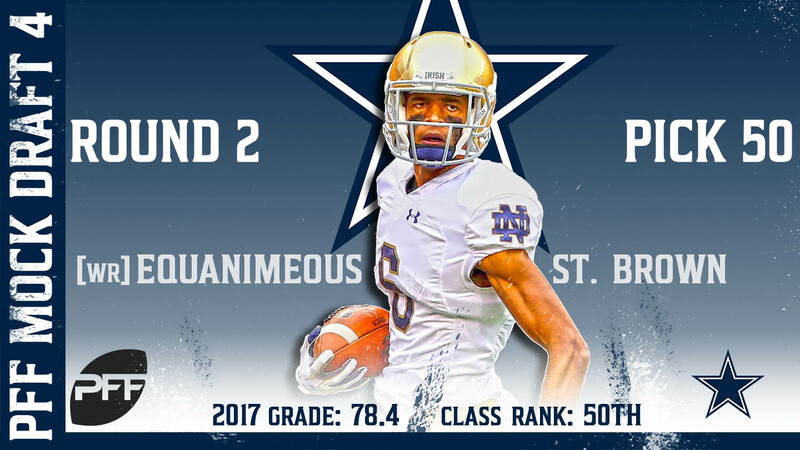 White was outstanding in 2016 and despite taking a step back in a new offense in 2017, still ranked sixth in the draft class in PFF grade on deep passes while also ranking sixth at avoiding turnover-worthy plays. Webb may have the best pure free safety in the class as he shows good range and ball skills on the back end, but he also has the quickness to match up with slot receivers. He graded at 84.3 overall last season. Fumagalli is one of the better all-around tight ends in the class as he can hold his own against defensive ends in the run game and he does a fine job of using his body and moving the chains in the middle of the field. He finished sixth in the draft class with 1.87 yards per route last season. Smith had an excellent career at Auburn, grading at 88.0-plus in each of the last two seasons. He can compete for immediate playing time up front for Minnesota. 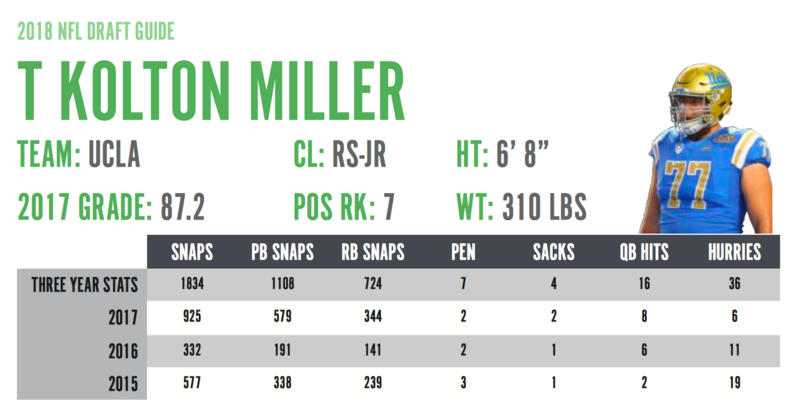 With left tackle Nate Solder moving on in free agency, there’s still a need for offensive tackle talent and Miller is good value at this point in the draft. He tested well athletically and he has one year of excellent production, grading at 87.2 overall, good for 11th in the nation last season. Baker is an athletic linebacker who did his best work during the 2016 season, grading at 87.7 overall. He could develop into an excellent coverage player with good range in Buffalo’s zone-heavy scheme. The Cardinals need another option opposite CB Patrick Peterson and Meeks has the size and movement skills to play both press and zone coverage. He posted a career-high 83.3 overall grade last season. Wims moves well for his 6-foot-4 frame, and he attacks the ball in the air with a strong catch radius. He adds a potential complement to WR DeAndre Hopkins on the outside after tying for 16th in the nation catching 55.0 percent of his deep targets. A classic pure production player, Lawler is worth a look in the top 100 after posting a 91.0 overall grade last season, good for third in the nation among edge defenders. He ranked in the top four as both a pass-rusher and as a run-defender, but he’ll drop in the draft due to a mediocre athletic profile. Elliott has good range in zone coverage, either on the back end or when working downhill in the box. He’s coming off an excellent 2017 season that saw him grade at 84.7 overall and he’s a great fit for what the Bengals like to do on defense.